Scotch Harry is back in this one, sadly without Big Stan but this gets a big positive from me reusing a great character from series 1. I quite like this one - it has a half decent story, Solly Solomon who is a right crook, Chisholm drinking in the Winchester and a nice comedic side! 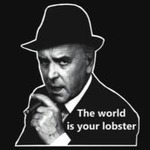 Another lovely episode with the return of Scotch Harry, a legendary Minder character IMO, minus his sidekick Stan. You just knew that something would go wrong when Arthur was entrusted to stage a robbery and sure enough it did, leaving Harry on the sick list and at the mercy of his ex Wife. "My word is my bond - stand on me"
Love this one, definitely one my favourites - Scotch Harry is a superb character brilliantly played by Phil McCall. One of the more comic episodes, littered with superb scenes and banter. Best bits - A drunk Chisholm at the Winchester, the café scene when Scotch Harry turns up, Chisholm at the hospital and in the car where a delirious Harry with his "burnt boat" tries to attack Arthur "get him off me - he's in a coma" - pure quality. Also a brief appearance by Bomber!! This is a great episode, really funny all the way through. Scotch Harry is a character and the banter between Chisholm and Jones is comedy gold. Arthur is quality throughout "that is the whole point you did not do the bizzo, that is why we are in this messo". Haha wonderful stuff. Fifty minutes of pure entertainment! Fun to see Scotch Harry again and drunk Chisholm is a series highlight. What's not to like? A 'refreshed' Mr Chisholm, the legendary John Bluthal, a mummified Scotch Harry, cracking dialogue, Pat Roach up a ladder and some great interplay between our two favourite coppers who have grown into a definite double-act. Love the bit at Harry's wife's house where he's forced to sit down, then jumps straight up again - Dennis seems to be enjoying the moment out-of-character. A great episode and I'm not even missing the rough-and-tumble stuff. We're approaching peak Minder here. weeks time on BBC4 !!! Perhaps Colin & Ray were back ! Top notch episode. Good to see Scotch Harry again. Might have been nice if Rycott was in this one to add to the continuity. The scene where Chisholm thinks he recognises him is good. The highlight though is when Terry and Arthur are taking Harry to hospital. Every piece of dialogue in that scene is brilliant. Special mention for John Bluthal, who is perfectly cast as Solly. Pat Roache becomes the fourth of the seven Auf Whiedersehen, Pet to appear. Shevaun Bryers, who played the nurse was very pretty but doesn't seem to have acted since an appearance in The Bill in 1987. This does the bizzo for me too. Fab ep. Great to see Scotch Harry back to 'do the bizzo' The scenes of him escaping from hospital were hilarious ! One thing I don't get; why didn't Chisholm put Terry in a lineup ? When asked, the nurse said she would recognise him again. I watched this one yesterday I hadn't seen it for a number of years but still think it's the best episode in Series 6. It's a Leon Griffiths one which I always love and the decision to bring back his character of Scotch Harry is a welcome one, however I doubt in 1985 when this was first broadcast many viewers had remembered him from the Series 1 episode ('The Smaller They Are') from 1979 and I think I'm right in saying that Series 1 or 2 for that matter hadn't been repeated since first broadcast also Series 1 had small viewing figures compared to the Minder height in 1985 so for many this episode was the first time they saw Scotch Harry, although I know he was mentioned and I think appeared in 'Minder Christmas Bonus' from 1983. His character is some what lighter but still pretty much the same and he really makes the episode. Could the reason why Big Stan wasn't brought back be due to the fact David Jackson had already been cast in another Series 6 episode 'Give Us This Day Arthur Daley's Bread'. There are plenty of comedy moments and the story is a good one with Arthur hiring incompetents to handle the robbery. The Beesley Brothers Billy & Benny make a good double act and I like the fact they have worked out it's Solly's factory without being told. Seeing Chisholm drunk in the Winchester Club is a nod back to the episode 'Around The Corner' where Jones is drunk in the Winchester. A great Minder moment is Terry telling Chisholm he has a rock solid alibi as he was drinking with him at the time of the robbery. Shevaun Bryers played the Nurse well and you could tell she didn't want to get Terry in trouble and appeared to fancy him or at least like him having met him on previous occasions that Terry appeared not to remember. Arthur adjusting his wing mirrors and checking things over after the car wash was a nice touch of an every day occurrence rarely portrayed on television. I feel Leon Griffiths stood his ground here on the character of Arthur in that he was not as tight fisted with money (as seen in earlier episodes) as he would later be portrayed. Mainly with him giving Scotch Harry the £500 when he didn't have to, but also the Beesley brothers stated they were being paid three grand what Arthur told Solly they'd get, normally Arthur would cream some off the top for himself. Neither of these two gestures would have happened in an Andrew Payne or Tony Hoare script. Are the beesley brothers , brothers in real life? The two actors who played them are Michael Sarne (Billy) and David Shawyer (Benny) despite them having different surnames they are in fact brothers in real life. On second viewing this is still a very good episode. 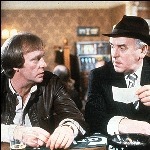 I really appreciate how well Minder holds up to repeated viewings. Drunk Chisholm is still funny and still a series highlight. This is a really amusing episode. Good story, some great lines. Excellent in my view. I thought the episode was good. right straight into the episode in true Minder fashion. Didn't have to wait for anything. Terry reacting to Arthur's plan right from the beginning. Get that all the way then the episode gets serious. "I know him..it's those minces!". Yeah I somewhat jumped when that happened but did laugh because it was a common police tactic to put suspect under pressure but a bit insensitive because Harry was in an nasty accident. Yeah I thought that was great trying to wonder where the line between if that was professional or taking it too far. I thought that was great also. I like it when they were trying to spy towards the end and the truck they were hiding behind drove away. Was a pleasant way to end the episode in my opinion and Terry and Arthur were greeting them. Well, I'm going to swim against the tide here - not one of my favourites, I have to say. In a pretty stereotype-filled little world, I found the ones portrayed here a little too one-dimensional; the 'wee Jock', the Oirish nurse and even the 'my boy, my boy' Jewish tailor (I adore John Bluthal in Dibley, by the way) - and the Beesley brothers were flat as a pancake. All a bit meh, to my taste. Sorry. However,the highlight was indeed Mr.Chisholm; "You can wipe that Welsh smirk off your face"..